Home » Nooze » Growth is … Good? Growth is good. That’s been the mantra of just about every society at every point in human history, at least until recently. More people means more to work the land and higher productivity. If it gets a bit out of hand, high growth can create a larger army to go knock off the neighbors and open things up even more. The pattern held through the industrial era and right up to the point where large undeveloped nations started to have trouble feeding themselves. There were incidents of mass starvation in some empires, likely even the Mayan, but until the 20th Century growth has always been something that everyone relies on. Peaceful societies have put growth to work taking care of the vulnerable and generally enjoying the few years we all have on this Earth a bit more. But what if growth slows down, or even stops? One of the defining features of the next generation is likely to be dealing with declining growth across the planet. It’s also one of those issues that no one is ready to talk about. To understand the issue, we should start with this piece in Barataria from three years ago. As the undeveloped and developing world become richer, their birthrates are declining – and the planet as a whole will be below replacement birthrate about 2050. That means that the population will peak just over 9 Billion and then start to fall. It’s an article worth reading again and following the links within to understand how big this change is. This may seem like nothing but good news all around, given that there are so many starving in poverty across the planet. There may be hope for them yet. But as life expectancy increases and medicine is capable of saving more people, there is likely to be an ever increasing load of people to care for. The issue is much like deflation, or a situation where people start to depend on constantly falling prices. Predictions for the future, including financing, depend on everything constantly increasing. Stability is actually a bad thing in the system that we have set up today. It shows when each nation hits the point where the working age population is scheduled to peak out, by year, and the size of that population is given by the size of the dot. Note that Europe is already hitting its peak, as has Japan. China is there today as well, probably due to their “one child” policies. All of Asia generally maxes out in the 2040s. That’s not to say that there will not be economic growth through this period. Growth also comes from productivity increases, especially through improvements in technology. Improved information, in particular, can improve information about needs and reduce waste. But there is a big difference between economic growth through more labor versus higher productivity. It comes down to how the benefits of this growth are distributed. Labor can negotiate its share, depending on political circumstances, but gains in productivity have typically gone to those who put up the capital to fund the operation. The definition of “money” starts to become an issue if you think about this long enough (unless your brain starts to hurt first). As we contemplate the world that our children will inherit, this important trend is going to be one of the most important ways that their lives will be defined. Today we see the whole world evening out as developing nations catch up to the developed world rapidly (see: “Gangnam Style”). In a short while we’ll all be in the same boat, contemplating a world where growth comes primarily from the human mind, not the arm. How that serves our hearts will define who we are as a species, gradually pulling back from a population level that threatens to ravage the entire planet. There is little doubt that economic growth, as we have come to understand it, is ending. Greater cooperation already defines our economy as it has become global. The next phase, normalizing and accepting the lack of growth, is probably the most important force that will define whatever economy rises after this Depression ends. And we haven’t even started to contemplate it in the popular press. There are a lot of links to important piece throughout this piece – if you want to know more, follow them. Thanks! This entry was posted in Nooze, People & Culture and tagged decline, globalism, growth, Population, productivity. Bookmark the permalink. This is very much on target. All our yak-yak is about stimulating or resuming, or whatever, “economic growth.” But our planet’s ability to support growth is at an end. Many if not most natural resources are already overdrawn. We are going to have to get over the presumption that prosperity = “growth,” and find our way to (overall) steady-state prosperity. But a steady-state economy without stagnation is hard to envision. Finding our way to one is going to be no small task…. Exactly. I tried to envision it, but that seemed way beyond a reasonable article on the scope of the problem (not to mention my own imagination). My kids will have to deal with it, though. I’ll say it here – Marx had a bit more to say about this than most people. His stuff is 150 years old or more, but it’s worth re-reading. No, I don’t expect that will sit well with a lot of people – especially given the nonsense that has built up around his teachings (on both sides of the politics). Great blog. No I haven’t heard of this and it is huge. Proves that politics today is about pure bullsh!t. Read an article the other day that was sorta about this issue. If the basic needs are pure water, food, energy (for heat, cooling,electricity and some transport) and shelter (maintaining and changing). Which one of these needs is labor intensive? The utility infrastructure needs updating. I know I am not quite clear on what I am trying to communicate here but couldn’t these needs be capital intensive rather than dependent on labor? Enen health care and education are changing. Please elaborate. Dan, you are right – the first thing to think about is what do we really need that is labor intensive and work out from there. Updating infrastructure is a big need all around the world and that will take labor. But I can see that a lot of what will drive the economy will be more capital intensive in the future, and how we handle that is a big issue, IMHO. It’s all starting to remind me of Kurt Vonnegut’s first novel, “Player Piano”, in which everyone who does not get an engineering degree has 2 choices – the Army or the “Reconstruction and Reclamation Corps”. You’re on the right track, no doubt. What will need people in the future? If labor is scarce around the world salaries have to go up. This could be a very big boom for people all around the world. Given what you say about China in particular I can see that they might actually wind up importing a lot more and some of that might come from here. So this sounds like good news to me all around. I have been thinking about the end of the Depression as you call it in 2017 and that is starting to look about right to me too. This could be an epic bull market. I wouldn’t worry too much about it if this is correct. Growth will come from new tech for sure. An excellent point! There is a big upside to this. This could be the antidote to the book The Coming Jobs War which I wrote about before. A shortage of labor is a good thing all around in some ways. Seriously, there may be a bunch of things that fall into place in the 2020s that make for a real boom, I agree! But it won’t be like past booms in many ways, and it will be more about sustainability. Good comments all around here, thank you! Realistic expectations will help a lot. If what you say about young people is correct they will do OK. I do not see why things have to grow forever myself. Things wear out and have to be replaced, that will be enough work for everyone. If we made all that in the USA there would be full employment I bet. It may work out. When I wrote this I was not optimistic at all, given what this means to our entire financial and corporate structure as we know it. No growth very much upends nearly everything. However, on a personal level, people may adjust very well and, as Anna pointed out, actually be scarce. It might be very good. I am about ready to suggest ways we can make a Golden Era of a kind – not just end this Depression. How’s that? No way corporations will be able to adjust if this happens. Wall Street is totally geared for ever expanding profits. Yes, that is the problem. I am looking into Islamic Banking as an answer. 🙂 I may write about this on Monday, not sure yet. But yes, it means that we have to re-think everything we do now. I included a link to this above, but I’m starting to think it’s even more important – it’s what I call The Beatles Effect, where an old idea from one nation goes dormant and then comes back to it from another place, changed slightly. 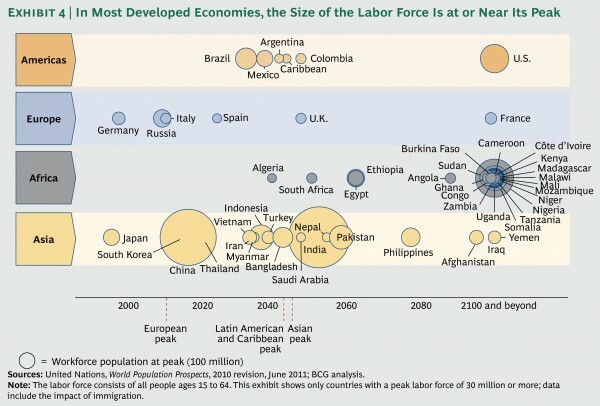 I think that the developing world is going to have a lot to teach us about how to run a “sustained” economy. I also may have to bring the concept of Resiliency back into the discussion. NPR had a fascinating feature on the aging population, particularly in Japan where people over 65 comprise 25% of the population. By contrast, the state of Florida’s agony population is 17%. They stressed the shrinking growth in Japan & eventual dearth of younger people to care for them.